The sound clip of the Arrow 3-1 doesn't do it justice, sounds a whole lot better at WOT . But I'm biased.The blue flames were pretty cool though. Did Triumph put lead in the stock cans ? You're up! Send me a sound clip by email and I'll host it and get it on. I'm assuming you must have gotten the arrow system at the dealer. Yeah the stock cans are heavy as hell! Do you accept diy setups? A quick "How I made it" would be appreciated too! Damnit Dirt do you know how many more I'm gonna need to add. Cheapo Rombo brand Suzuki TL 1000 round alu cans shortened, polished, new billett stainless front caps to match Triumph midpipe. 45mm id baffle with fiberglass packing. Total cost ~100€. Stock midpipe, baffle removed from collector. C'mon Mongo. Show us Stage 2. Brilliant thread! 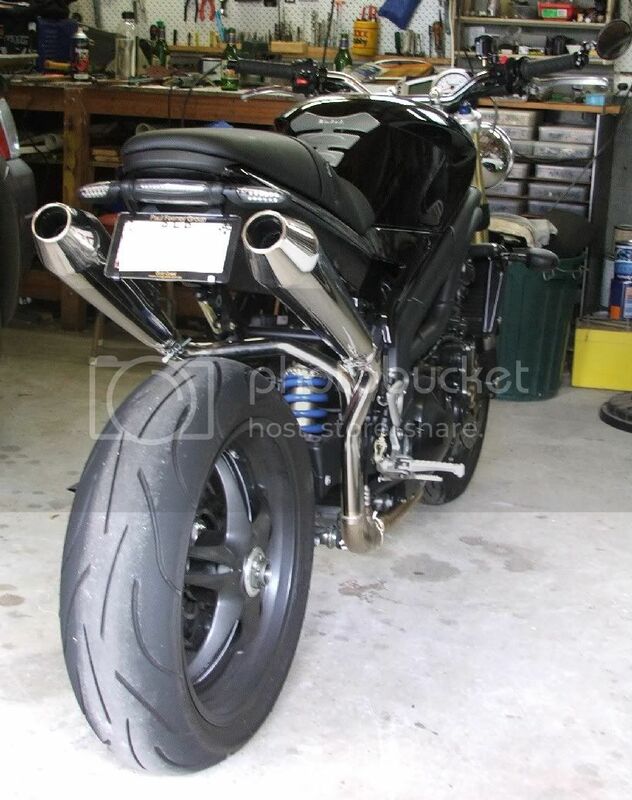 The all inclusinve exhaust thread is finally here, plus you added a pic of my Leo Vince -- BRAVO! !